Each pupil chooses two origami sheets. Only recognized commercial origami sheets should be used. Folding instructions: With the 2 sheets opposite vertices are folded. It is suggested that before finalizing the folding the pupils must place the 2 vertices in the correct position and only after doing so the fold can be pressed down using a finger moving along the fold. The teacher should always demonsrate with their sheet and not touch or give help to the sheet of the pupils. A discussion question:Can you count the straight sides and vertices of the triangle? Pupils should be asked to choose 1 vertex and then move thier finger along the straight side until they reach a new vertex. From this new vertex (formed by changing direction) they will move along the straight side and by changing direction and returning to the starting vertex a new vertex is formed.In all their are 3 vertices in the triangle. Decomposition and composition of shapes: Each pair of pupils should place their 4 triangles on the desk and together compose new shapes on condition that straight sides of the same length can be joined exactly together. 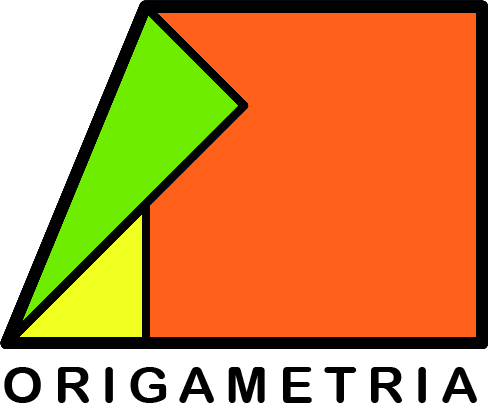 Decomposition and composition of shapes: The triangles should be joined together only with staight sides of equal length. 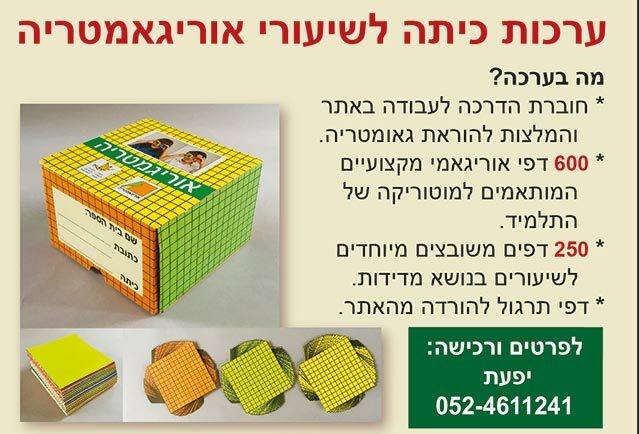 The teacher can demonstrate this to the pupils. Pupils can be asked to count the number of straight sides and vertices of their new composed shapes. Decomposition and composition of shapes: Quadrilaterals with 4 straight sides,triangles with 3 straight sides,pentagons with 5 straight sides and hexagons with 6 straight sides have been composed. The following quadrilaterals have been composed: An isoceles trapezoid,a square,a rectangle and a parallelogram. Folding instructions: Fold opposite vertices as shown and open the larger triangle. All folding activities must be done by the pupil by himself without any help from the teacher except for demonstrating with their own model. Folding instructions: Fold two vertices as shown. At all stages of folding it is important to explain to the pupils that there are 3 stages of folding. 1.The folding instruction must be listened to before touching the sheet. 2. The instruction what has to be done must be fully understood. 3. Perform the requested folding. 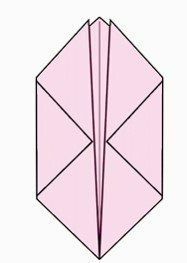 Folding instructions: Fold two vertices on to the line of symmetry as shown in the animation. The teacher will demonsrate the folding on the teachers sheet without touching the folding done by the pupils. This can be repeated several times. A discussion question: Which are the different polygons that can be seen in the new folded model ? Although it is possible to see many polygons like parallelograms it is suggested that the pupils explain what they have found while mentioning the number of straight sides and vertices. Folding instructions: Fold out 2 triangles as shown. The teacher will demonsrate the folding on the teachers sheet without touching the folding done by the pupils. This can be repeated several times as necessary. Folding instructions: Fold 2 triangles as shown. Folding instructions: Insert a figure inside the model and press on the vertex as shown. Naming the final model is individual as well as decorating the model.